Since we have been keeping healthy, staying slim and running — eating plays a big part. I especially have to work to keep the genetic curses under control: blood pressure, cholesterol, and high glucose (thanks mom and dad!). So we have learned to cut out junk food, processed foods, and animal fats to a large degree. However, healthy foods can be delicious and nutritious with a minimum of animal fats, processed foods, etc. 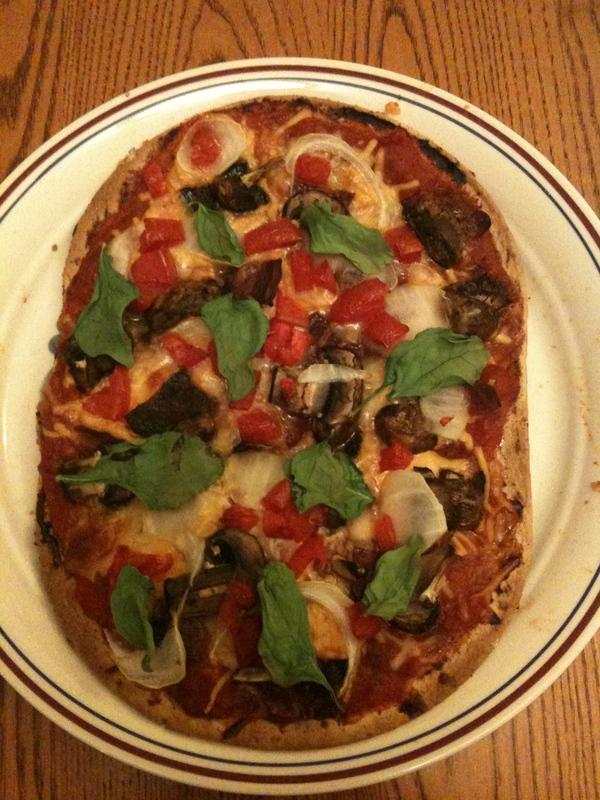 For example, look at this pizza I made tonight. Made with 100% whole wheat “flat out bread” at only 100 calories per piece. On top of that some simple tomato paste and some 2% reduced fat pizza cheese. Then mushrooms, onions, tomatoes, and spinach. You can even put on bacon bits or ground turkey. Put that in the oven at 400 degrees for about 10-15 minutes and voila! — just as good as you can get in a restaurant! But, it is lo-cal, healthy, with vegetables, fiber, vitamins and is it ever good! A few questions related to ordinations always seem to surface about this time of year. Below are four (well, actually, five) points on blessings and indulgences related to ordinations that might be useful to recall. Click here.